During the late 16th century, Holy Roman Emperor Rudolf II turned Prague into Europe’s cultural capital, amassing the greatest art collection of his day. Cost was no object and he invited the best goldsmiths, stone carvers, and clock makers to his court. Rudolf kept the treasures inside Hradcany Castle in a chamber of art, or Kunstkammer, a highly personal reflection of his world view. Today, Rudolf’s prized possessions along with those of his art-loving Habsburg relatives reside at the Kunsthistorisches Museum in Vienna. After a decade long closure, the museum’s refurbished Kunstkammer reopened March 1. Though the museum itself is lavishly decorated by famous artists including Gustav Klimt, and crowned with an ornate cupola, nothing prepares you for this 20-room embarrassment of riches. The “museum within a museum” features a dizzying 2,200 objects arranged chronologically — from the late Middle Ages and Renaissance to the 18th century Baroque period. Most are displayed in tall, radiantly lit glass cases, making it possible to experience the works close-up with 360 degree views. Among the highlights are gold and lapidary objects, bronze and ivory statuettes, and celestial globes and clocks. One of Rudolf’s art-obsessed relatives was his uncle, Archduke Ferdinand of Tyrol, whose own celebrated art chamber at Ambras Castle near Innsbruck attracted visitors like Montaigne, Queen Christina of Sweden, and Goethe. In 1570, Ferdinand stood in for France’s Charles IX at his wedding to Rudolf’s sister, Elizabeth of Austria. In gratitude, the groom gave the Archduke several lavish gifts – including the Saliera by Florentine sculptor Benvenuto Cellini. Worth an estimated $65 million, the Saliera made headlines a decade ago when it was stolen from the museum, buried in a forest outside Vienna, and retrieved three years later. 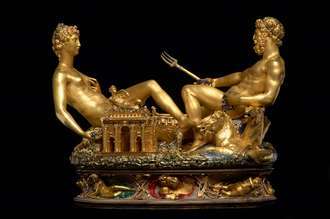 Created in Paris for Francis I, the salt cellar depicts the reclining figures of the sea god Neptune and earth goddess Ceres, along with a ship to hold salt and temple for pepper. In his autobiography, Cellini proudly describes how he hammered the work from gold foil, adorning Ceres “with every refinement in the world I could imagine…” While cleaning the treasure, conservators left a small scratch on Ceres, now considered part of the object’s history. Other show stoppers are by the Miseronis, a talented family of Milanese lapidary artists. Gasparo Miseroni’s stunning lapis lazuli bowl features a fierce dragon motif in gold, enamel, rubies, emeralds and pearls. Gasparo’s nephew Ottavio Miseroni teamed up with Rudolf’s personal jeweler, Jan Vermeyen, on an exquisite green prasem bowl with gold enamel and garnets. Ottavio’s son Dionysio Miseroni created a rock crystal pyramid by cutting four progressively smaller cylindrical goblets out of a large vase, similar to Russian stacking dolls. Like his grandfather Charles V, Rudolf II loved clocks and employed a team of clockmakers. Among them was the Swiss astronomer Jost Burgi, whose planet clock is richly decorated with mythical and astrological symbols from the old Ptolemaic and new Copernican systems. In contrast to the scientific instruments are rarities thought to possess magical and healing powers. These include an ostrich egg goblet, a diamond and ruby studded tankard made of narwhal tusk, and an emerald encrusted “bezoar” stone from a llama’s stomach. The oldest object on view is a 9th century Carolingian ivory tablet. Some 800 years later, 17th century Archduke Leopold Wilhelm and his nephew Emperor Leopold I helped popularize ivory carving in Vienna. Among the standouts is Apollo and Daphne by Tyrolese artist Jakob Auer, inspired by Bernini’s life-size marble masterwork. Auer captures the moment when the nymph is transformed into a laurel tree just in time to escape Apollo’s advances. Most of the creamy white material used by carvers came from elephant tusks. In preparation for the Kunstkammer’s reopening, about 350 objects were cleaned and restored. During this process, curators made the delightful discovery that many of the centuries-old automatons still work — like an elegant silver automaton with the goddess Diana riding a centaur who shot arrows at dinner guests. Recipients were required to fill their wine glasses. Action videos of these sophisticated toys are available on iPads in the galleries. In a fitting finale, the Kunstkammer closes with Empress Maria Theresa’s gold and porcelain breakfast service in Berger Hall. Overhead, Julius Victor Berger’s 1891 ceiling painting pays homage to Habsburg art patrons and their favorite artists. We recognize them now — Rudolf II with his circle of artists and Benvenuto Cellini holding his royal salt cellar. Titian, Rubens and Rembrandt seem to be inviting us upstairs to the picture gallery.